Pre-European contact distribution of the Iroquoian languages. 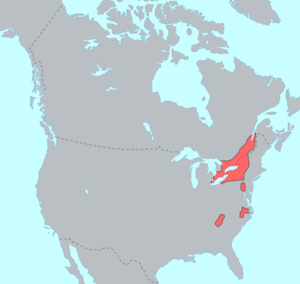 The Iroquoian languages are a language family of indigenous peoples of North America. They are known for their general lack of labial consonants. The Iroquoian languages are polysynthetic and head-marking. Today, all surviving Iroquoian languages except Cherokee in Oklahoma and Mohawk are severely endangered or critically endangered, with only a few elderly speakers remaining. Cherokee in North Carolina is considered severely endangered. Evidence is emerging that what has been called the Laurentian language appears to be more than one dialect or language. Ethnographic and linguistic field work with the Wyandot tribal elders (Barbeau 1960) yielded enough documentation for scholars to characterize and classify the Huron and Petun languages. The languages of the tribes that constituted the tiny Wenrohronon[a], the powerful Susquehannock and the confederations of the Neutral Nation and the Erie Nation are very poorly documented. They are historically grouped together, and geographically the Wenro's range on the eastern end of Lake Erie placed them between the two much larger confederations. To the east of the Wenro, beyond the Genesee Gorge, were the lands of the Iroquois and southeast, beyond the headwaters of the Allegheny River, lay the Susquehannocks. The Susquehannocks and Erie were militarily powerful and respected by neighboring tribes. These groups were called Atiwandaronk, meaning 'they who understand the language' by the surviving Huron (Wyandot people). By 1660 all of these peoples but the Susquehannocks and Iroquois were defeated and scattered, migrating to form new tribes or to be adopted into others—the practice of adopting valiant enemies into the tribe was a common cultural tradition of the Iroquoian peoples. The group known as the Meherrin were neighbors to the Tuscarora and the Nottoway (Binford 1967) in the American South and may have spoken an Iroquoian language. There is not enough data to determine this with certainty. Attempts to link the Iroquoian, Siouan, and Caddoan languages in a Macro-Siouan family are suggestive but remain unproven (Mithun 1999:305). As of 2012, a program in Iroquois linguistics at Syracuse University, the Certificate in Iroquois Linguistics for Language Learners, is designed for students and language teachers working in language revitalization. Six Nations Polytechnic in Ohsweken, Ontario offers Ogwehoweh language Diploma and Degree Programs in Mohawk or Cayuga. Starting in September 2017, the University of Waterloo in Waterloo, Ontario have started offering a credit course in Mohawk; the classes are to be given at Renison University College in collaboration with the Waterloo Aboriginal Education Centre, St. Paul's University College. ^ Historical examination of the Jesuits records suggest ca 1640-42 the Wenro may have had as few as three villages sandwiched between Buffalo & Rochester (Niagara and Genesee Rivers). ^ Hammarström, Harald; Forkel, Robert; Haspelmath, Martin, eds. (2017). "Iroquoian". Glottolog 3.0. Jena, Germany: Max Planck Institute for the Science of Human History. ^ Mithun, Marianne. "Grammaticalization and Polysynthesis: Iroquoian" (PDF). Retrieved June 8, 2015. ^ "UNESCO Atlas of the World's Languages in danger". www.unesco.org. Retrieved December 17, 2017. ^ "Iroquoian Languages". www.languagegeek.com. Retrieved August 9, 2015. ^ "Certificate in Iroquois Linguistics for Language Learners". University College. Retrieved September 6, 2012. ^ Gale Courey Toensing (September 2, 2012). "Iroquois Linguistics Certificate at Syracuse University Comes at Important Time for Native Languages". Indian Country Today Media Network. Retrieved September 6, 2012. ^ Bueckert, Kate (August 17, 2017). "Mohawk language course to be offered for 1st time at UW". CBC News. Retrieved August 17, 2017. Barbeau, C. Marius (1960), Huron-Wyandot Traditional Narratives in Translations and Native Texts, National Museum of Canada Bulletin 47; Anthropological Series 165, [Ottawa]: Canada Dept. of Northern Affairs and National Resources, OCLC 1990439 . Binford, Lewis R. (1967), "An Ethnohistory of the Nottoway, Meherrin and Weanock Indians of Southeastern Virginia", Ethnohistory, Ethnohistory, Vol. 14, No. 3/4, 14 (3/4), pp. 103–218, doi:10.2307/480737, JSTOR 480737 . Chilton, Elizabeth (2004), "Social Complexity in New England: AD 1000–1600", in Pauketat, Timothy R.; Loren, Diana Dipaolo (eds. ), North American Archaeology, Malden, MA: Blackwell Press, pp. 138–60, OCLC 55085697 . Goddard, Ives, ed. (1996), Handbook of North American Indians, Vol. 17: Languages, Washington, DC: Smithsonian Institution, ISBN 0-16-048774-9, OCLC 43957746 . Lounsbury, Floyd G. (1978), "Iroquoian Languages", in Trigger, Bruce G. (ed. ), Handbook of North American Indians, Vol. 15: Northeast, Washington, DC: Smithsonian Institution, pp. 334–43 [unified volume Bibliography, pp. 807–90], OCLC 58762737 . Mithun, Marianne (1984), "The Proto-Iroquoians: Cultural Reconstruction from Lexical Materials", in Foster, Michael K.; Campisi, Jack; Mithun, Marianne (eds. ), Extending the Rafters: Interdisciplinary Approaches to Iroquoian Studies, Albany: State University of New York Press, pp. 259–82, ISBN 0-87395-781-4, OCLC 9646457 . Mithun, Marianne (1985), "Untangling the Huron and the Iroquois", International Journal of American Linguistics, 51 (4), pp. 504–7, doi:10.1086/465950, JSTOR 1265321 . Mithun, Marianne (1999), The Languages of Native North America, Cambridge: Cambridge University Press, ISBN 0-521-23228-7, OCLC 40467402 . Rudes, Blair A. (1993), "Iroquoian Vowels", Anthropological Linguistics, 37 (1), pp. 16–69 . Ruttenber, Edward Manning. 1992 . History of the Indian tribes of Hudson's River. Hope Farm Press. Snow, Dean R.; Gehring, Charles T; Starna, William A. 1996. In Mohawk country: early narratives about a native people. Syracuse University Press. An anthology of primary sources from 1634-1810.